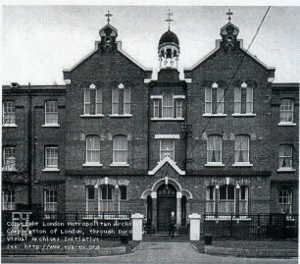 The South Grove Workhouse was opened in 1871 as a detached workhouse for the Whitechapel Union, on a three-acre site in the Hamlet of Mile End Old Town. The Whitechapel Union’s 1858-59 workhouse in Baker’s Row or Charles Street (later Vallance Road) continued in use as the Union’s Infirmary (demolished). Unlike the earlier and larger detached City of London Union Workhouse to the east, the South Grove Workhouse lacked a frontage on Mile End Road but had a longer frontage on the east side of South Grove (later Southern Grove). The South Grove Workhouse was designed by Richard Robert Long, architect and surveyor of 25 Laurence Pountney Lane, London. The surviving main three-storey building, together with small single-storey receiving wards and other mostly single-storey ancillary buildings, is shown on Long’s February 1871 block plans, which accompanied his building and drainage application to the Hamlet of Mile End Old Town. The proposed three-storey main building is shown consisting of an advanced central block flanked by wide northern and southern wings, labelled females and males respectively. Behind the central block and between the back parts of the wide three-storey wings, is what appears to be a single-storey dining hall, with a single-storey kitchen and boiler house in an L-shaped back addition. As built, the front elevation of the main building or block is well seen in the centre right of a c.1897 photograph of the South Grove Workhouse, with some of the elderly inmates sitting in the separate gardens in front of their respective wings. A 1929 plan of what was now named the Whitechapel Institution indicates that the upper floors in the three-storey wings were occupied by wards and that the first-floor front of the central block was the master’s quarters. The ground-floor front of the central block is shown with the committee room on the north side and the general office on the south side of the main entrance hall, with long corridors at right angles running through the centre of each wing. The ground-floor front rooms off the northern corridor are labelled doctor’s room, master’s office, nurses dining room; and the back rooms are labelled dispensary, scullery, sewing room. A large ground-floor front room in the southern wing is labelled mens’ dormitory; and the back rooms are labelled bread room, male staff mess, mens’ dormitory.5 Given that most of these ground-floor rooms in the main block were fulfilling essential workhouse functions, it is more than likely that the arrangement of central corridors and rooms dates from 1871. The 1929 plan also shows each ground-floor corridor serving a staircase in the middle of the eastern or back part of its wing. These two staircases (and probably a staircase from the main entrance hall) provided access to the wards on the first and second floors. The wards were described in 1929 as being “of four-bed width with a row of columns down the centre”. The 1929 plan also shows Long’s small single-storey dining hall replaced by a larger ground-floor dining hall extending to the eastern boundary of the three-acre site; with a new single-storey range to the south, containing kitchen, scullery and boiler house. Also lavatories or wash rooms with WCs in extensions at the outer end of the back part of each wing. The Builder June 25 1898 p.625 records that the architect for the new dining hall, lavatories etc. was Mr Bruce J. Capell and that the tender for £7,689 from Sheffield Bros. was accepted by the Whitechapel Guardians. As noted on the 1929 plan, the “new dining hall” is superimposed by first and second floors. These were probably also built in 1898 to create the three-storey central E wing: with its western part on the site of Long’s single-storey dining hall and inserted between the inner opposed end walls of the back parts of Long’s wide three-storey wings. With the construction of Capell’s large three-storey lavatory blocks (as shown on the 1929 plan), Long’s small three-storey lavatory blocks (on the eastern or back sides of his wide three-storey wings) were demolished. The new larger dining hall, kitchen and scullery were needed because the accommodation at South Grove had been substantially increased in 1894 by the erection of two three-storey pavilion blocks. Designed by Bruce J. Capell ARIBA architect of 70 Whitechapel Road E, the two blocks stood on either side of the main block, as shown on the 1893-94 OS plan. The northern or women’s pavilion block is seen to the left of Long’s 1871 main building or block in the c.1897 photograph; with what appear to be projecting roof slopes on the western sides of three superimposed covered walkways linking the two blocks. Also, parts of Long’s 1871 single-storey receiving wards. To build the northern or women’s pavilion block, Capell had to demolish Long’s northern ancillary buildings and provide replacements at the northern end of the site. Capell’s replacements were themselves demolished for a new three-storey building erected in 1904. The building was last used as part of the Council’s Poplar Neighbourhood Centre; for which purpose, partition walls were inserted in the former wards on the upper floors. The three-acre site is now a Local Development Framework “suggested site” for a primary school. The modern office building on the northern part of the site is likely to be retained but the surviving workhouse building and two other buildings on the southern part of the site are threatened with demolition. Three-storey London stock brick building with slate roofs, designed by Richard Robert Long. Built 1871 with an advanced twin-gabled central entrance block, flanked by wide northern and southern wings. Each wide wing with front and back pitched roofs ending in twin gables. Back gabled ends of each wing with a small 1898 extension. Behind the central entrance block an 1898 three-storey central E wing with a single-storey range to the south. Keyed semicircular gauged brick entrance arch (with original fanlight) on stone-capped brick piers with subsidiary semicircular gauged brick arches over narrow side window openings. All three arches under a linked hood mould and surmounted by a stone-coped gablet. Set back above the entrance a first-floor window opening under a stone lintel and semicircular brick relieving arch with herringbone infill. Also a second-floor Venetian window opening with semicircular gauged brick arch and panel over central window. Frontispiece crowned by an octagonal domed cupola on a narrow pitched roof flanked by stone-coped gables, each surmounted by a pierced stone-coped gablet. Gabled walls with hard-blue-brick string courses between ground and upper storeys. And all three storeys in each gabled wall with a hard-blue-brick band at window level. Each ground-floor tripartite window opening with two slim brick piers capped by stone skewbacks supporting segmental gauged brick arches. Each pair of first-floor window openings with segmental gauged brick arches. And each of the two second-floor paired window openings with a central brick pier capped by a stone skewback supporting semicircular gauged brick arches. All window openings with stone sills. Northern ground-floor window lighted the committee room, southern ground-floor window the general office, and first-floor windows the master’s quarters. Upper storeys in the front elevation of each wide wing with five recessed window bays, divided by simple shallow brick pilasters rising from the ground storey. Ground storey defined by two courses of splay bricks at the base of each recessed window bay. Oversailing splay brickwork at top of each bay breached by upper part of second-floor window opening. All window openings with stone sills and cambered gauged brick arches. Ground-floor arches surmounted by splay bricks at bases of recessed window bays; first-floor arches by hard-blue-brick bands in recessed window bays; and second-floor arches by eaves cornice of oversailing brickwork. Ground-floor rooms in both wings mostly used for administrative, medical and staff purposes. Upper floors in both wings occupied by double-width wards, each with a central line of cast-iron columns. Women’s wards in northern wing and men’s in southern wing. Western slope of each wing’s pitched front roof with perforated wrought-iron grilles in small lead-lined ‘dormers’, probably for ventilating roof space. Outer end walls of twin-roofed wings distinguished by twin stone-coped gables with end-wall chimney stacks. Each back gabled wall mostly concealed by one of Bruce J. Capell’s 1898 three-storey lavatory blocks with outer stone-coped gable and adjacent small access tower, under a lean-to roof. Upper storeys of southern access tower (and adjoining part of front gabled wall with truncated chimney stack) covered in pebbledash. Also some rebuilding of wall between first-and second-floor window openings in southern lavatory block. Behind the central entrance block, Bruce J. Capell’s 1898 three-storey central E wing with ground-floor dining hall. With his 1898 single-storey range to the south, containing the kitchen and scullery (in the adjacent higher part), and the boiler house (in the lower end part with various roof lights). As built, Long’s main workhouse building of 1871 was a corridor-plan workhouse: central administration block or master’s house flanked by accommodation ranges with a “single-storied back wing” behind the central block “containing the kitchen or dining-hall/chapel”. The corridor-plan workhouse was in fact the main building or block in a workhouse which also included smaller ancillary buildings.2 About 150 corridor-plan workhouses were erected between 1840 and 1875,3 and South Grove must have been one of the last to be built in England. The corridor-plan workhouse was superseded by the separate-block workhouse with a separate central administration block, linked by covered ways to separate accommodation blocks or pavilions. The 1894 pavilion blocks on either side of the 1871 corridor plan workhouse created a very unusual arrangement at South Grove. 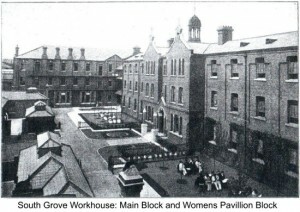 Although the 1894 pavilion blocks have been demolished, the increased accommodation at South Grove is represented by the 1871 building’s partly-inserted 1898 central E wing, with its large ground-floor dining room for all the inmates at the enlarged South Grove workhouse. In addition to its two 1894 pavilion blocks, the 1871-1898 South Grove corridor-plan workhouse has lost its 1871 single-storey ancillary buildings, and its 1904 building. However, given the rarity of surviving examples of the multifunctional corridor-plan workhouse building, it is a nationally important representative of the small multifunctional urban corridor-plan workhouse building with original wards and rooms for administrative, medical and staff purposes. And a large ground-floor dining room in a later three-storey central or back wing, with a single-storey kitchen, scullery and boiler house range. • 1849 part central range and eastern range of main workhouse building containing master’s rooms and matron’s room, and accommodation for infirm men, unruly men and married couples. Long’s main workhouse building of 1871 is included in a list of four London workhouse buildings (for aged and infirm inmates) with double-width wards of the type reintroduced by Henry Saxon Snell at his 1867 St Marylebone Workhouse in Northumberland Street.6 Double-width wards with a central line of cast-iron columns accommodated four rather than the two rows of beds in the standard single-width ward (Appendix 1). The inclusion of the main workhouse building at South Grove was probably based on the 1929 LCC description of four-bed-width wards “with a row of columns down the centre”. However, the 1929 ground-floor plan clearly shows a central corridor running from one end of the building to the other. And it is more than likely that this corridor-plan workhouse with twin-roofed wings also had central corridors on first and second floors. On the other hand, it is most unlikely that the 1929 LCC description of the wards is incorrect. In which case, the main workhouse building is a very unusual example of a corridor-plan workhouse with a central corridor on the ground floor and double-width wards on the first and second floors in the two wings.